Sculptor Anne Bouie shared this inspiring sculpture of the Mexican slave rebel and maroon leader Yanga. 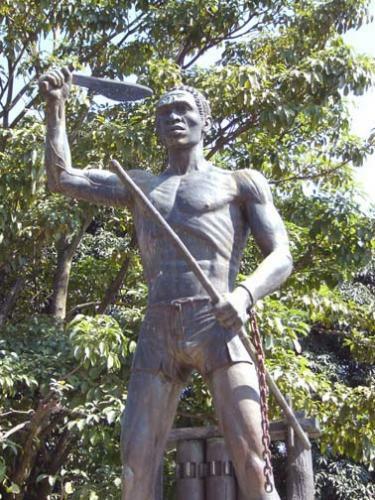 In the sculpture, Yanga casts off his chains and holds high a knigfe and spear, symbols of violent insurrection. Yanga takes a heroic pose, his eyes staring upwards at the heavens, his feet firmly and defiantly planted. You cannot help but feel inspired by this striking image. Yet we see few sculptures like this here in the United States. The most popular sculpted images of slaves feature kneeling slaves in chains or slaves being freed from captivity by gracious whites (see Kirk Savage’s excellent book on this topic, Standing Soldiers, Kneeling Slaves). American popular consciousness casts slaves as victims and looks upon slavery as a depressing and guilty part of our nation’s past. 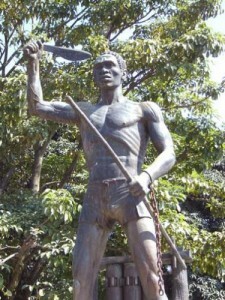 I hope that the first commemorative statues about the 1811 revolt will portray the rebel slaves in the same light as this Yanga sculpture – and in the same light as I try to portray them in my book – as sophisticated and complex, politically aware, heroes who were willing to sacrifice their lives for freedom and equality. We have an amazing statue here in Detroit……a family of slaves that is pointing across the Detroit River to where they can now see Canada after completing their journey on the underground railroad. It’s in Hart Plaza, quite a sight to see.